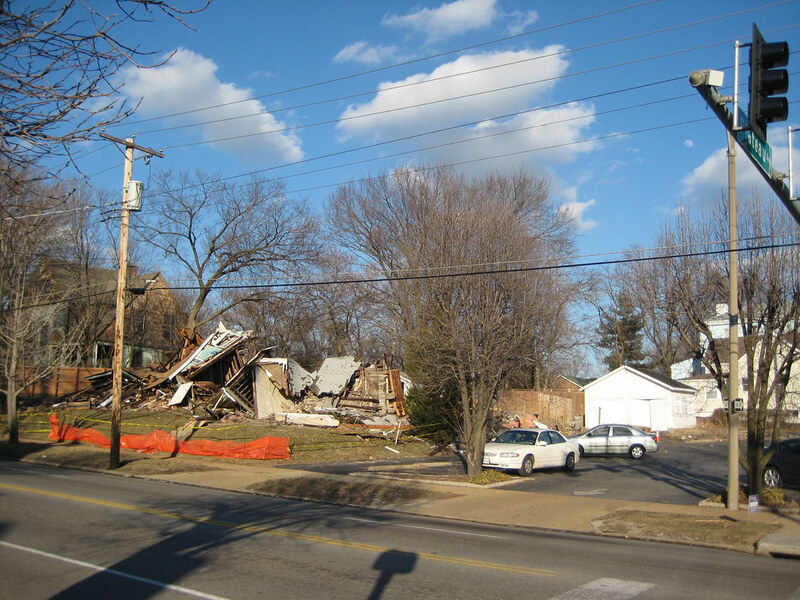 As Dotage St. Louis first posted Wednesday, Olympia, the Greek restaurant that has been a fixture on McCausland for years has suddenly demolished two houses across the street to expand one of two existing parking lots that they own at the intersection of McCauseland and Plateau. 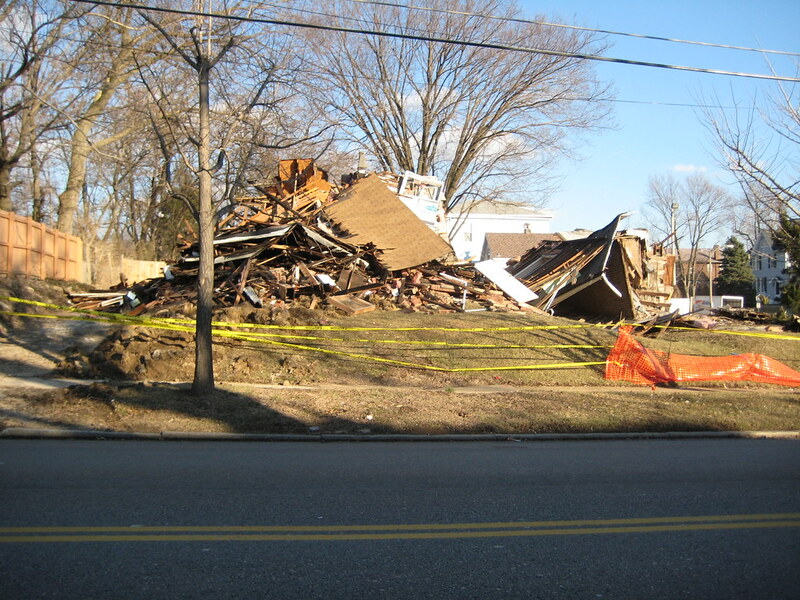 I went by late yestererday afternoon to take a look and 1532 and 5536 McCausland had been reduced to piles of debris. In the past two days there has been much conversation about this, mostly people condemning the action, as I have, but also a few people saying we should not blame Olympia. Ultimately it seems that this is about being urban or not being urban. We should blame Olympia for not realizing that some of their customer base appreciates that they are in an urban location and does not mind parking on the street when both their lots are full. Some of us will no longer be patronizing Olympia because of what we feel is a lack of respect for the neighborhood where they are located. I have no doubt that others probably expressed other opinions, but unfortunately they were the ones who spoke up. We should also blame the lack of leadership at the City from the Alderman to the lack of any comprehensive enforceable standards to govern this kind of action. This is not the first time this has happened, and unless there are zoning standards that have the authority of law to prevent this from occurring, it will not be the last. 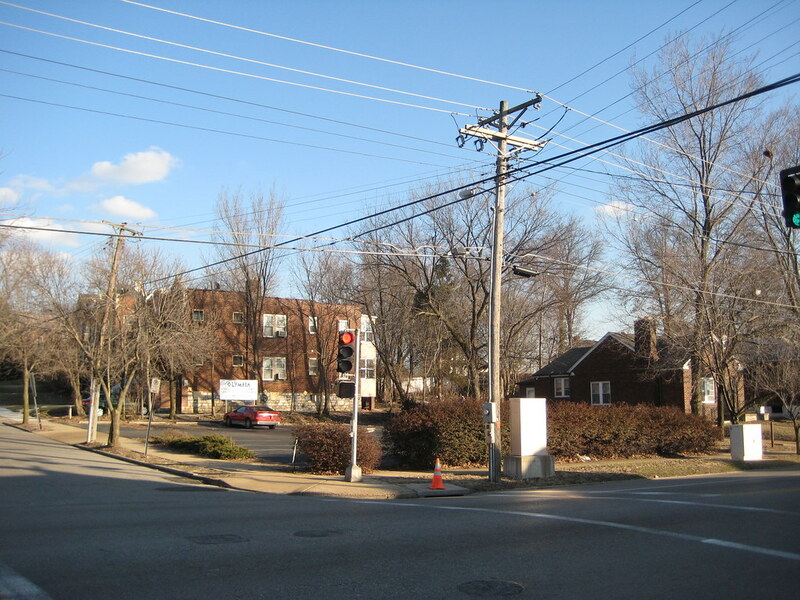 The existing Olympia lot at the southeast corner of the intersection. The second photo shows the smaller lot (with the piles of debris net door) on the northeast corner that will be expanded. 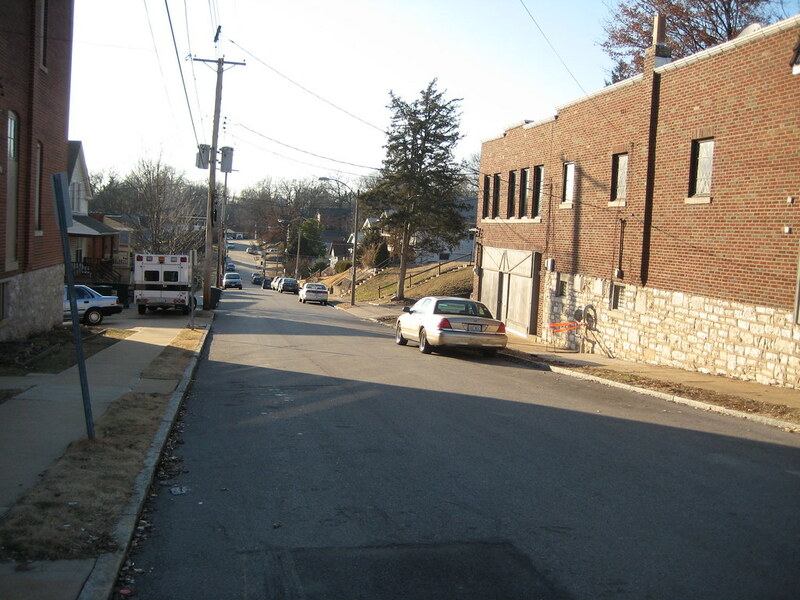 While parking on McCausland is restricted, there is plenty of extra street parking on Plateau that does not require crossing McCausland to get to the restaurant. 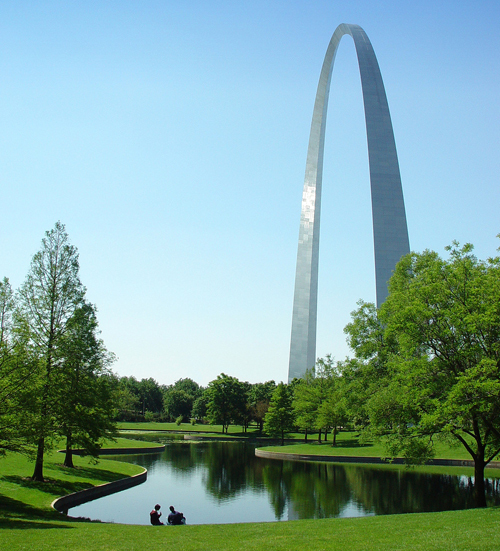 Busch Stadium and the Arch are two of the top attractions in St. Louis. Over three million fans from St. Louis and out of town pack Busch to see the Cardinals and the Gateway Arch is a must see stop for most visitors. Try walking between these two popular landmarks though and you will quickly find yourself up against a wall of interstate ramps and concrete walls. This is probably very frustrating for tourists who do not know their way around town, leaving them wondering if they just visited a monument to American westward expansion or the walled city of Carcassonne. If you live here in St. louis, say you want to have a picnic lunch or dinner in a quiet spot by the south reflecting pool at Arch grounds then want to walk over to the ball game. Today you have two options. Walk north to Walnut then head west to Broadway then south to the Stadium or head three blocks south through Chouteau's Landing to Gratiot then west under the catacombs of Interstate 55 to Broadway then three blocks north again to the Stadium. This is your view from the southwest corner of Arch Grounds, an ugly mess of highway ramps and a dead end for pedestrian trying to walk west to Busch Stadium. Photo by Kara Clark Holland. 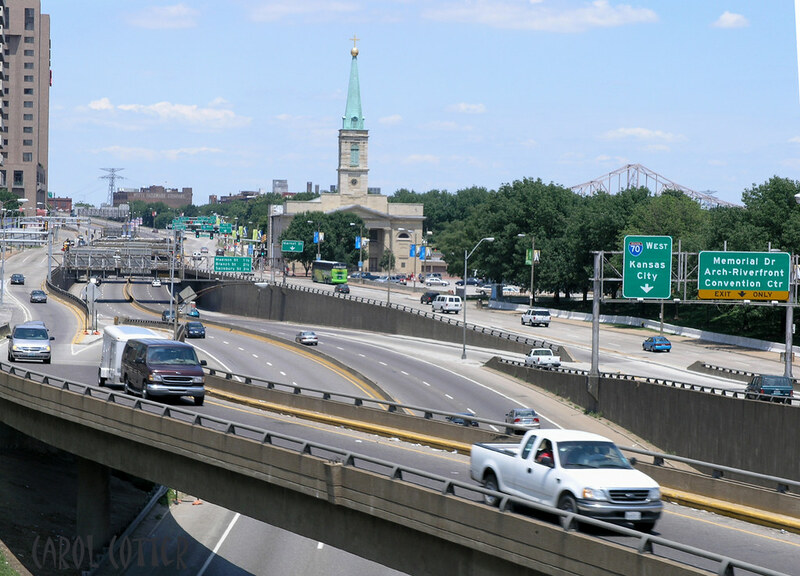 The plan for a New Memorial Drive, proposed by City to River would eliminate the highway and re-work ramps to the Poplar Street Bridge so that they no longer block access. 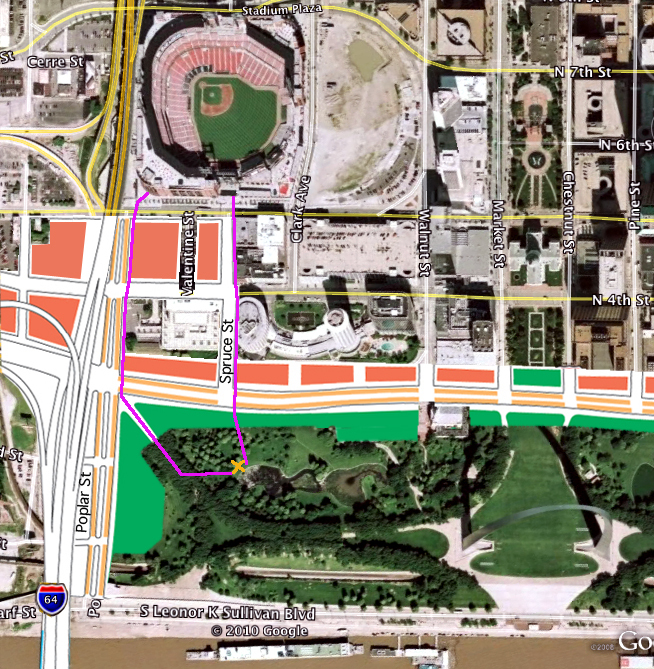 Interstate 55/44 would transition to a new boulevard Poplar Street at the south end of the Arch grounds would be restored as a through street from the riverfront to Broadway. 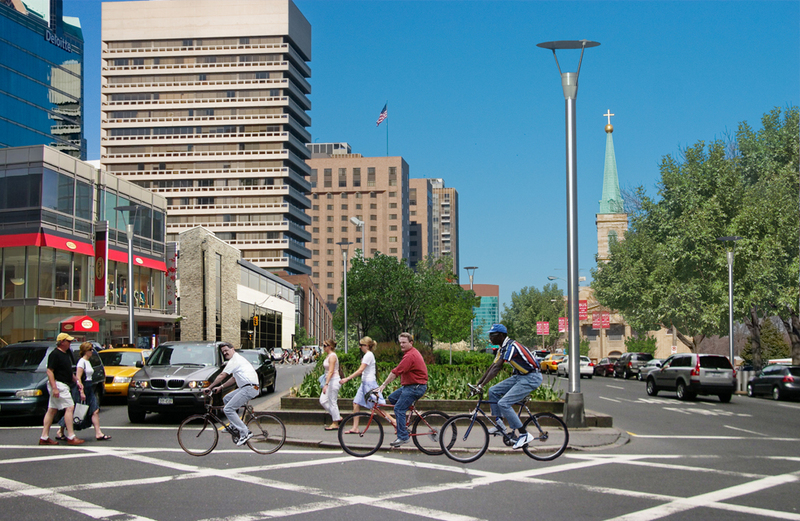 Spruce Street would also connect directly to the Arch grounds at the newly re-configured boulevard. Photo above by Carol Cotter. The map above shows how the New Memorial drive would radically improve the urban landscape at the south end of the Arch grounds. It would connect Busch Stadium to the Arch for the first time ever. Busch Stadium and the south end of Downtown would also have a new direct connection to the slowly emerging Chouteau's Landing district as well as to an improved riverfront. This would greatly improve development potential for Chouteau's Landing, and I would also be willing to bet that St. Louisians would visit their only national park more often, as well as the riverfront itself. Ask yourself this question: When was the last time you saw the river? For the first 200 years of its existence, St. Louis was well connected to the Mississippi River. Through much of the 19th century the riverfront remained the center of commerce and the lifeblood of a growing metropolis. 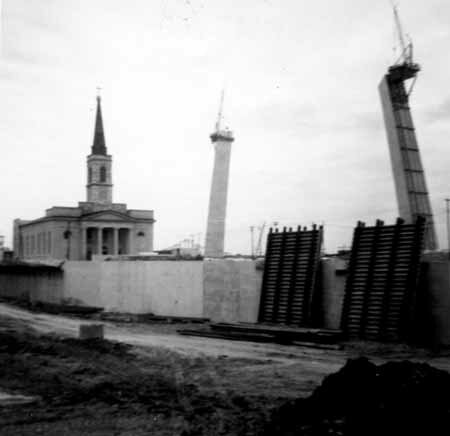 Even after demolition of 40 square blocks of buildings in 1940-42 to make way for a new memorial to westward continental expansion, connection to the riverfront, while weakened, was not completely severed. In 1964, as St. Louis was celebrating it's 200th birthday, construction began on the Gateway Arch. At the same time that the elegant ribbon of reinforced concrete sheathed in gleaming stainless steel began to rise into the skyline though, another larger and not so elegant ribbon of concrete, steel and asphalt ripped gashes through the landscape of St. Louis cutting us off from our new national park, with its gleaming centerpiece monument, the neighborhoods to the north and south and from the river itself from whence our City was born. Forty six years later we remain physically and psychologically separated from our riverfront. This morning City to River, an all volunteer citizen group launched its website which illustrates how St. Louis can reopen its front door. City to River has been active since early 2009 looking at ways to improve connections to the Arch grounds, Laclede's Landing, Chouteau's Landing and our riverfront. 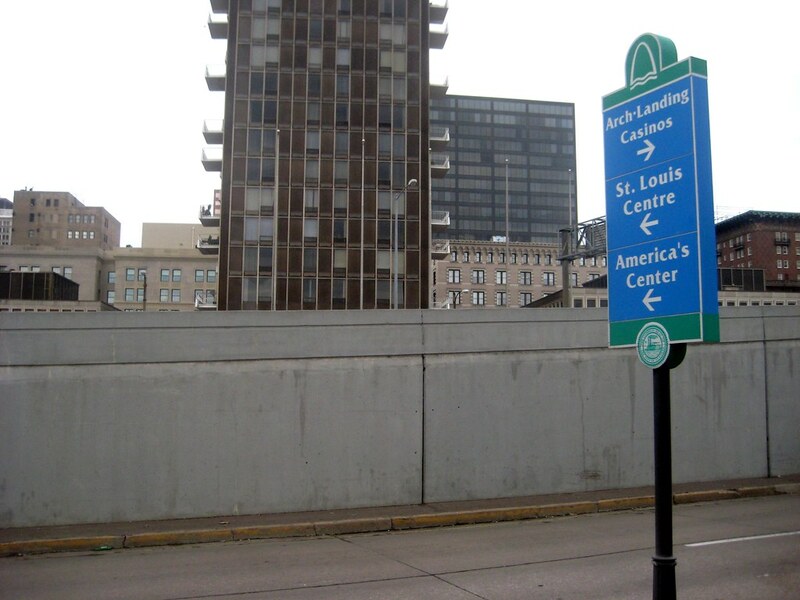 We came to the conclusion that real reconnection could only come with the of complete removal of Interstate 70 from the Poplar Street Bridge north to Cass Avenue and replacement with a new pedestrian friendly Memorial Drive at street level. 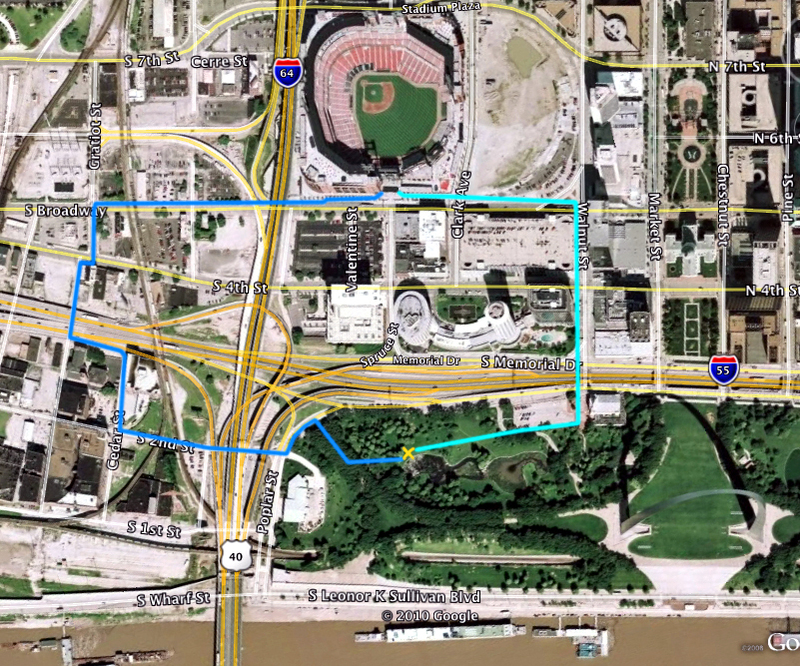 The map above shows how the City's street grid would once again connect with the Arch grounds and the riverfront neighborhoods to the north and south. 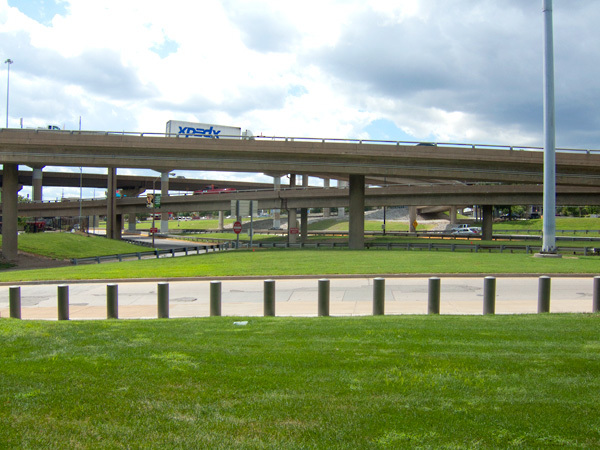 Reclaimed land form the former Interstate right-of-way could be available for construction of new pedestrian friendly buildings facing the new boulevard or extensions of the existing buildings which now mostly turn their back to the Interstate. Take a tour of the site and see the possibilities for yourself. Please consider joining us and how we can transform what is currently an unwelcoming series of barriers into a new front door for St. Louis. 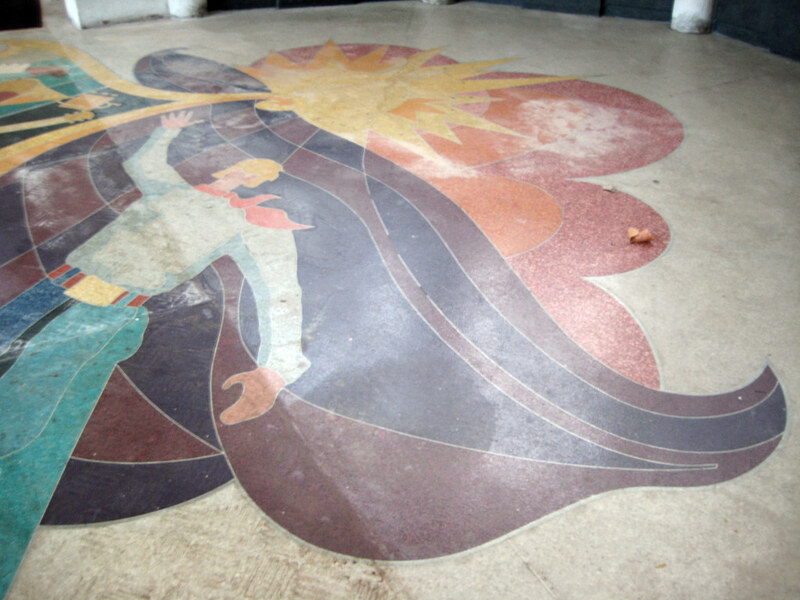 Channel 5 News reported tonight that the terrazzo work of art that has graced the Muny's front door for 38 years has been completely destroyed (photo above from Channel 5's website). 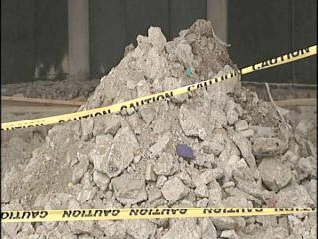 Last month a water main break under the area caused some heaving and cracking in portions of the terrazzo but much of it was undamaged. Instead of salvaging what could be saved and repairing or replacing the remaining portions, the entire work is now apparently a pile of rubble! The report said that the Muny has been in contact with the original artist, Nancy Day, and are exploring options for replacement. Nancy Day was a student at Washington University when she designed the work that was installed in 1971. A photo of the undamaged area of the work closer to the ticket booths. A large percentage or the work appeared to have been free from cracks or heaving.